I attended a care exhibition the other week and this only served to reinforce the fact I am a helpful product nerd. 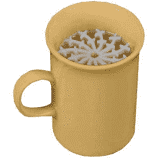 Forget high-tech instruments and wizardry, give me a simple gadget that means an elderly person can enjoy a cup of tea safely and ….. I am in my element! Odd but true. Have you seen these? Specially designed for people who have rigors or tremors associated with Parkinsons, dementia or just old age, who find shaky hands tend to make them spill their drinks. This comes with a plain coloured mug, but can sit inside your favourite one meaning you retain your individuality and dignity. This insert does take up space so really you get half a cup of tea or coffee however in my mind this is still better than spilling hot liquids down yourself risking scalds and wet clothes. It is easily removed for washing and is re-useable. It is not overly cheap but it does attract VAT relief for all eligible customers which helps. I am a great believer that really useful items such as this make fantastic Christmas or Birthday Gifts. Sometimes the value of an item is in its problem-solving ability and not in the retail price.